Make sure you are in a quiet location with good lighting. Before your interview find a location that is quiet and away from interruption. Make sure there is ample lighting in the room. If you're sitting near a window, make sure you're not behind it. Sit with your computer, facing the window. Before your interview, go to the URL supplied by your recruiter to download the Highfive app. Make sure you have a good enough internet connection to support video. 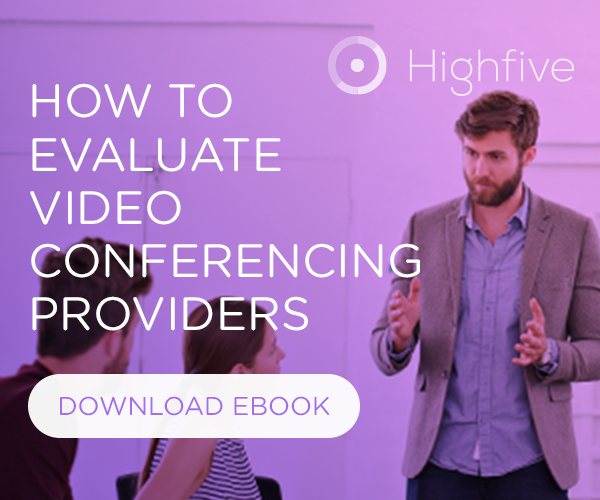 Video interviews are different than phone screens. Treat them more like an in-person interview. Feel free to communicate with body language and expression. The TV is switched to the correct input. The TV volume is turned on. Pro Tip: Give the candidate a tour of the office by moving the call from the TV to your laptop and walk around the office to give them a tour. When you are scheduling an interview with a candidate, let them know early that you will be using video to conduct the interview. Confirm with the candidate they are comfortable using video. Confirm with the candidate they have access to a good internet connection. And that's it! If you have any questions, please don't hesitate to reach out to help@highfive.com. Thanks for using Highfive!